Unfortunately, there are significant barriers to deploying AI technology on U.S. ambulances, and reimbursement may be the biggest barrier. Ambulance companies are reimbursed on a three-tiered system based on the level of provider, not on specific tests or procedures performed by prehospital providers. This is disconnected from patient outcomes and quality of care. Therefore, ambulance companies have little financial incentive to adopt new technology. One strategy that companies developing AI tools for the pre-hospital can employ in order to overcome the reimbursement barrier is to focus on the value to hospitals. Since hospitals are more likely reimbursed on a value-based system, they have a financial incentive for patients to receive the best care even in the pre-hospital environment. The “low-hanging fruit” are the 10% of ambulances that are owned by hospitals. MaxQ.AI is pursuing this strategy as all the CT ambulances are hospital owned. 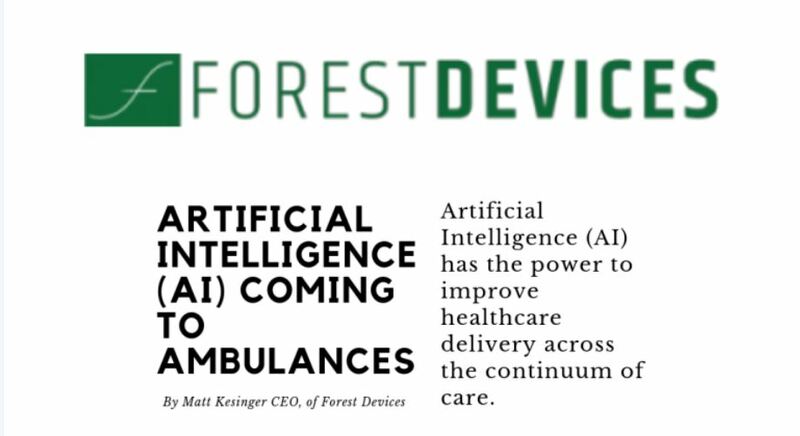 Forest Devices is going after the estimated 50% of the ambulances that partner with hospitals to restock disposable supplies. Using a razor- razorblade model, the company will sell devices at a very low cost and make the bulk of revenue from selling higher margin disposable electrodes used with the device to hospitals that restock ambulances. Artificial Intelligence is changing the face of healthcare, and even ambulances are starting to see it. But innovative business strategies are needed to fully penetrate this market. Forest Devices is a medical device startup located in Pittsburgh, Pennsylvania. We are the creators of ALPHASTROKE, the first stroke screening device that can potentially be used by all medical personnel in any environment. By re-purposing established technology, our team is developing a novel and objective stroke detection method. It would enable early and fast triage so stroke patients go to the appropriate level of care. Providing a faster, safer, and cheaper alternative, over 2 million unnecessary emergency room CT scans could be averted every year. With thousands of deaths and billions in costs annually due to inadequate stroke detection, we are determined to become the new standard of care. All of our team members have been impacted by stroke to friends or family members. At Forest Devices, we will change the way the world approaches stroke detection.